Would you like to use a Live GPS Tracker in the UK? We provide the best live GPS Trackers, with FREE live online tracking. Our live GPS Trackers can be tracked in real-time, in the UK or abroad. You can see the live GPS tracker location either via text message, or with live online GPRS tracking. 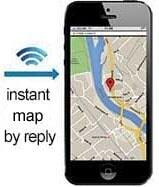 You can text your live GPS Tracker to get an instant location text by reply. The coordinates in the text can be entered into Google Maps or Google Earth, or if you have an iPhone or android – simply click on the live GPS tracker link to see the map location immediately. The live GPS tracker just needs a GPS Tracker SIM card, to be able to send and receive text messages. They can also work as mini mobile phones, with onboard microphones and speakers. We provide a step-by-step guide to getting your live GPS Tracker online. Its totally free – you just need a data enabled SIM (which should cost no more than £5 per month if you use our SIM partners). You just need to send about three text messages to your live GPS tracker, to set up the SIM card APN, username and password. Then you log into an online account (free to set up and use) and see your live GPS Tracker’s location – in real time. There is a 30 day history, so you can see where your GPS tracker has been. Our Personal GPS Tracker has it all – small, compact, beautifully made, and easy to set up with live online tracking. It is shipped from the UK, and is sent with First Class recorded delivery. It has an SOS button, ability to call a phone number at the push of a button, and can receive calls. Remote listening allows you to listen in via the live GPS Tracker’s onboard microphone. The battery life is up to 10 days – around 3-4 days with regular location reports. You won’t find a better live GPS Tracker with anywhere near the battery life! GPS Tracker - How Can It Be Used?